For the most part, our alternative heating products are easy to maintain. But there are some important items crucial to the longevity, and efficiency of your wood furnace heating unit. We'll provide you with all the information you need to maintain your heating system. But if you prefer, we have a yearly maintenance program available to you. Post sale, you will likely have some questions. Don't hesitate to call us. We're always here to address your concerns. If a site visit is needed, we'll be there. At Renewable Energies, LLC our goal is to make sure you understand the full potential of your Central Boiler Wood Furnace, or pellet heating furnace system because your return on investment matters to us. Next, we'll schedule a visit to your home, or business to determine the best location for, and most efficient installation of, your heating unit. Typically, you'll get a written estimate back within a couple of days. And always, our estimates, and on-site assessments are free of charge. 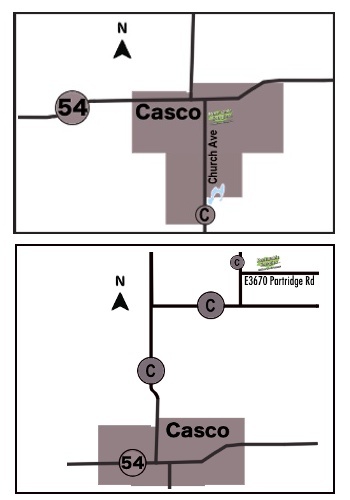 Update: As of late Sept 2018, we are now located in Casco, WI - our new office is located just one block south of Hwy 54 on Church Ave (County Hwy C - see map below) and our new Retail Location is located just north of Casco, WI on Partridge Rd - just East of Hwy C (see map to right).